This article is about the history of the island of Taiwan. For the history of the polity which currently governs Taiwan, see history of the Republic of China. In 1662, Koxinga, a loyalist of the Ming dynasty who had lost control of mainland China in 1644, defeated the Dutch and established a base of operations on the island. His forces were defeated by the Qing dynasty in 1683, and parts of Taiwan became increasingly integrated into the Qing empire. Following the First Sino-Japanese War in 1895, the Qing ceded the island, along with Penghu, to the Empire of Japan. Taiwan produced rice and sugar to be exported to the Empire of Japan, and also served as a base for the Japanese invasion of Southeast Asia and the Pacific during World War II. Japanese imperial education was implemented in Taiwan and many Taiwanese also fought for Japan during the war. 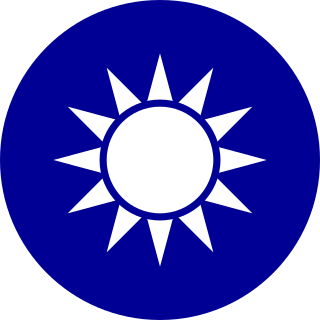 In 1945, following the end of World War II, the nationalist government of the Republic of China (ROC), led by the Kuomintang (KMT), took control of Taiwan. In 1949, after losing control of mainland China in the Chinese Civil War, the ROC government under the KMT withdrew to Taiwan and Chiang Kai-shek declared martial law. The KMT ruled Taiwan (along with the Islands of Kinmen, Wuqiu and the Matsu on the opposite side of the Taiwan Strait) as a single-party state for forty years, until democratic reforms in the 1980s, which led to the first-ever direct presidential election in 1996. During the post-war period, Taiwan experienced rapid industrialization and economic growth, and was known as one of the "Four Asian Tigers". In the Late Pleistocene, sea levels were about 140 m lower than in the present day, exposing the floor of the shallow Taiwan Strait as a land bridge that was crossed by mainland fauna. The oldest evidence of human presence on Taiwan consists of three cranial fragments and a molar tooth found at Chouqu and Gangzilin, in Zuozhen District, Tainan. These are estimated to be between 20,000 and 30,000 years old. The oldest artifacts are chipped-pebble tools of a Paleolithic culture found in four caves in Changbin, Taitung, dated 15,000 to 5,000 years ago, and similar to contemporary sites in Fujian. The same culture is found at sites at Eluanbi on the southern tip of Taiwan, persisting until 5,000 years ago. At the beginning of the Holocene 10,000 years ago, sea levels rose, forming the Taiwan Strait and cutting off the island from the Asian mainland. The only Paleolithic burial that has been found on Taiwan was in Xiaoma cave in the southeast of the island, dating from about 4000 BC, of a male similar in type to Negritos found in the Philippines. There are also references in Chinese texts and Taiwanese aboriginal oral traditions to pygmies on the island at some time in the past. Around 3,000 BC, the Neolithic Dapenkeng culture abruptly appeared and quickly spread around the coast of the island. Their sites are characterized by corded-ware pottery, polished stone adzes and slate points. The inhabitants cultivated rice and millet, but were also heavily reliant on marine shells and fish. Most scholars believe this culture is not derived from the Changbinian, but was brought across the Strait by the ancestors of today's Taiwanese aborigines, speaking early Austronesian languages. Some of these people later migrated from Taiwan to the islands of Southeast Asia and thence throughout the Pacific and Indian Oceans. Malayo-Polynesian languages are now spoken across a huge area from Madagascar to Hawaii, Easter Island and New Zealand, but form only one branch of the Austronesian family, the rest of whose branches are found only on Taiwan. The Dapenkeng culture was succeeded by a variety of cultures throughout the island, including the Tahu and Yingpu cultures. Iron appeared at the beginning of the current era in such cultures as the Niaosung Culture. The earliest metal artifacts were trade goods, but by around 400 AD wrought iron was being produced locally using bloomeries, a technology possibly introduced from the Philippines. Early Chinese histories refer to visits to eastern islands that some historians identify with Taiwan. Troops of the Three Kingdoms state of Wu are recorded as visiting an island known as Yizhou (夷洲) in the 3rd century. The Book of Sui relates that Emperor Yang of the Sui dynasty sent three expeditions to a place called "Liuqiu" early in the 7th century. 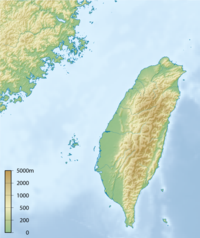 Later the name Liuqiu (whose characters are read in Japanese as "Ryukyu") referred to the island chain to the northeast of Taiwan, but some scholars believe it may have referred to Taiwan in the Sui period. Okinawa Island was referred to by the Chinese as "Great Liuqiu" and Taiwan as "Lesser Liuqiu". Portuguese sailors, passing Taiwan in 1544, first jotted in a ship's log the name of the island Ilha Formosa, meaning "Beautiful Island". In 1582 the survivors of a Portuguese shipwreck spent ten weeks battling malaria and aborigines before returning to Macau on a raft. A transient population of Han Chinese made out of traders and pirates started migrating to southwest Taiwan in the early 17th century before Dutch rule. Taiwan's southwest was already home to a Chinese population numbering close to 1,500 before 1623 when the Dutch first came. The Dutch East India Company (VOC) came to the area in search of an Asian trade and military base. Defeated by the Portuguese at the Battle of Macau in 1622, they attempted to occupy Penghu, but were driven off by the Ming authorities. 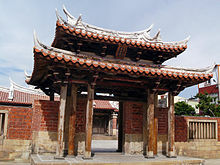 They then built Fort Zeelandia on the islet of Tayowan off the southwest coast of Taiwan. (The site is now part of the main island, in modern Anping, Tainan.) On the adjacent mainland, they built a smaller brick fort, Fort Provintia. 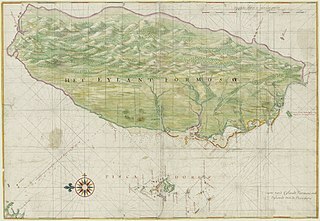 In 1626, the Spanish Empire, viewing the Dutch presence on Taiwan as a threat to their colony in the Philippines, established a settlement at Santísima Trinidad on the northeast coast of Taiwan (modern Keelung), building Fort San Salvador. They also built Fort Santo Domingo in the northwest (modern Tamsui) in 1629, but had abandoned it by 1638. The small colony was plagued by disease and a hostile local population, and received little support from Manila. The Dutch Governor Pieter Nuyts got entangled in a dispute with the Japanese Hamada Yahei. The Dutch were defeated at the Battle of Liaoluo Bay by the Chinese Zheng Zhilong in 1633. The Dutch set out to turn Taiwan into a Dutch colony. The first order of business was to punish villages that had violently opposed the Dutch and unite the aborigines in allegiance with the VOC. The first punitive expedition was against the villages of Baccloan and Mattauw, north of Saccam near Tayowan. The Mattauw campaign had been easier than expected and the tribe submitted after having their village razed by fire. The campaign also served as a threat to other villages from Tirossen (modern Chiayi) to Lonkjiaow (Hengchun). The 1636 punitive attack on Lamay Island in response to the killing of the shipwrecked crews of the Beverwijck and the Golden Lion ended ten years later with the entire aboriginal population of 1100 removed from the island including 327 Lamayans killed in a cave, having been trapped there by the Dutch and suffocated in the fumes and smoke pumped into the cave by the Dutch and their allied aborigines from Saccam, Soulang and Pangsoya. The men were forced into slavery in Batavia (Java) and the women and children became servants and wives for the Dutch officers. The events on Lamay changed the course of Dutch rule to work closer with allied aborigines, though there remained plans to depopulate the outlying islands. In 1642, the Dutch ejected the Spanish from the north of the island. They then sought to establish control of the western plains between the new possessions and their base at Tayouan. After a brief but destructive campaign in 1645, Pieter Boon was able to subdue the tribes in this area, including the Kingdom of Middag. The VOC administered the island and its predominantly aboriginal population until 1662, setting up a tax system, schools to teach romanized script of aboriginal languages and evangelizing Christianity. Although its control was mainly limited to the western plain of the island, the Dutch systems were adopted by succeeding occupiers. The first influx of migrants from coastal Fujian came during the Dutch period, in which merchants and traders from the mainland Chinese coast sought to purchase hunting licenses from the Dutch or hide out in aboriginal villages to escape the Qing authorities. Most of the immigrants were young single males who were discouraged from staying on the island often referred to by Han as "The Gate of Hell" for its reputation in taking the lives of sailors and explorers. The Dutch originally sought to use their castle Zeelandia at Tayowan as a trading base between Japan and China, but soon realized the potential of the huge deer populations that roamed in herds of thousands along the alluvial plains of Taiwan's western regions. Deer were in high demand by the Japanese, who were willing to pay exorbitant prices for use of the hides in samurai armor. Other parts of the deer were sold to Han traders for meat and medical use. The Dutch paid aborigines for the deer brought to them and tried to manage the deer stocks to keep up with demand. The Dutch also employed Han to farm sugarcane and rice for export. Some of these rice and sugarcane products reached as far as the markets of Persia. Unfortunately, the deer the aborigines had relied on for their livelihoods began to disappear, forcing the aborigines to adopt new means of survival. On the mainland, Manchu forces broke through Shanhai Pass in 1644 and rapidly overwhelmed the Ming dynasty. In 1661, a naval fleet led by the Ming loyalist Koxinga arrived in Taiwan to oust the Dutch from Zeelandia and establish a pro-Ming base in Taiwan. Koxinga was born to Zheng Zhilong, a Chinese merchant and pirate, and Tagawa Matsu, a Japanese woman, in 1624 in Hirado, Nagasaki Prefecture, Japan. He was raised there until seven and moved to Quanzhou, in the Fujian province of China. In a family made wealthy from shipping and piracy, Koxinga inherited his father's trade networks, which stretched from Nagasaki to Macao. Following the Manchu advance on Fujian, Koxinga retreated from his stronghold in Amoy (Xiamen city) and besieged Taiwan in the hope of establishing a strategic base to marshal his troops to retake his base at Amoy. In 1662, following a nine-month siege, Koxinga captured the Dutch fortress Zeelandia and Taiwan became his base (see Kingdom of Tungning). The Taiwanese Aboriginal tribes who were previously allied with the Dutch against the Chinese during the Guo Huaiyi Rebellion in 1652 turned against the Dutch during the Siege of Fort Zeelandia and defected to Koxinga's Chinese forces. The Aboriginals (Formosans) of Sincan defected to Koxinga after he offered them amnesty. The Sincan Aboriginals then proceeded to work for the Chinese and behead Dutch people in executions. The frontier aboriginals in the mountains and plains also surrendered and defected to the Chinese on 17 May 1661, celebrating their freedom from compulsory education under the Dutch rule by hunting down Dutch people and beheading them and trashing their Christian school textbooks. Koxinga died four months after the siege was over, there were speculations that he died in a sudden fit of madness when his officers refused to carry out his orders to execute his son Zheng Jing. Zheng Jing had an affair with his wet nurse and conceived a child with her. Other accounts are more straightforward, attributing Koxinga's death to a case of malaria. Following the death of Koxinga, his son Zheng Jing took over the Zheng regime, leading the remaining 7,000 Ming loyalist troops to Taiwan. In response to raids by Zheng Jing and in an effort to starve out the forces in Taiwan, the Qing decreed to relocate all of the southern coastal towns and ports that had been the targets of raids by the Zheng fleet and thus provided supplies for the resistance. This measure largely backfired, and between 1662 and 1664, six major waves of immigration occurred from these coastal towns to Taiwan, spurred by the severe hardships incurred from the Qing relocation policy. In a move to take advantage of this Qing misstep, Zheng Jing promoted immigration to Taiwan by promising free eastern land cultivation and ownership for peasants in exchange for compulsory military service by all males in case the island was in danger of a Qing invasion. In 1683, following a naval engagement with Admiral Shi Lang, one of Koxinga's father's trusted friends, Koxinga's grandson Zheng Keshuang, surrendered to the Qing dynasty. There has been much confusion about Taiwan's association with the rumored "Island of Dogs," "Island of Women," etc., which were thought, by Han literati, to lie beyond the seas. Taiwan was officially regarded by the Kangxi Emperor as "a ball of mud beyond the pale of civilization" and did not appear on any map of the imperial domain until 1683. The act of presenting a map to the emperor was equal to presenting the lands of the empire. It took several more years before the Qing court would recognize Taiwan as part of the Qing realm. Prior to the Qing dynasty, China was conceived as a land bound by mountains, rivers and seas. The idea of an island as a part of China was unfathomable to the Han prior to the Qing frontier expansion effort of the 17th century. Despite the expense of the military and diplomatic campaign that brought Taiwan into the imperial realm, the general sentiment in Beijing was ambivalent. The point of the campaign had been to destroy the Zheng-family regime, not to conquer the island. The Kangxi Emperor expressed the sentiment that Taiwan was "the size of a pellet; taking it is no gain; not taking it is no loss" (彈丸之地。得之無所加，不得無所損). His ministers counseled that the island was "a ball of mud beyond the sea, adding nothing to the breadth of China" (海外泥丸，不足為中國加廣), and advocated removing all the Chinese to mainland China and abandoning the island. It was only the campaigning of admiral Shi Lang and other supporters that convinced the emperor not to abandon Taiwan. [unreliable source?] Koxinga's followers were forced to depart from Taiwan to the more unpleasant parts[which?] of Qing controlled land. By 1682 there were only 7000 Chinese left on Taiwan as they had intermarried with aboriginal women and had property in Taiwan. The Koxinga reign had continued the tax systems of the Dutch, established schools and religious temples. From 1683, the Qing dynasty ruled the island as Taiwan Prefecture and in 1875 divided the island into two prefectures, north and south. 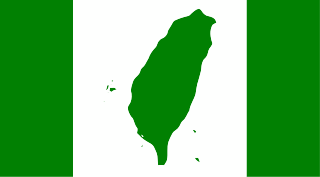 In 1887, the island was declared as a separate Fokien-Taiwan Province. The Qing authorities tried to limit immigration to Taiwan and barred families from traveling to Taiwan to ensure the immigrants would return to their families and ancestral graves. Illegal immigration continued, but many of the men had few prospects in war-weary Fujian and thus married locally, resulting in the idiom "has Tangshan[a] father, no Tangshan mother" (Chinese: 有唐山公，無唐山媽; Pe̍h-ōe-jī: Ū Tn̂g-soaⁿ kong, bô Tn̂g-soaⁿ má). The Qing tried to protect aboriginal land claims, but also sought to turn them into tax paying subjects. Chinese and tax paying aborigines were barred from entering the wilderness which covered most of the island for the fear of raising the ire of the non taxpaying, highland aborigines and inciting rebellion. A border was constructed along the western plain, built using pits and mounds of earth, called "earth cows", to discourage squatting. Given the strategic and commercial value of Taiwan, there were British suggestions in 1840 and 1841 to seize the island. In September 1841, during the First Opium War, the British transport ship Nerbudda became shipwrecked near Keelung Harbour due to a typhoon. The brig Ann also became shipwrecked in March 1842. Most of the crew were Indian lascars. Survivors from both ships were transferred by authorities to the capital Tainan. The Taiwan Qing commanders, Ta-hung-ah and Yao Ying, filed a disingenuous report to the emperor, claiming to have defended against an attack from the Keelung fort. In October 1841, HMS Nimrod sailed to Keelung to search for the Nerbudda survivors, but after Captain Joseph Pearse found out that they were sent south for imprisonment, he ordered the bombardment of the harbour and destroyed 27 sets of cannon before returning to Hong Kong. Most of the survivors—over 130 from the Nerbudda and 54 from the Ann—were executed in Tainan in August 1842. The Aboriginals often slaughtered the shipwrecked crews of Western ships. In 1867 the entire American crew of the Rover were massacred by aboriginals in the Rover incident. When the Americans launched the punitive Formosa Expedition in retaliation, the aboriginals defeated the Americans and forced them to retreat, killing an American marine while suffering no casualties themselves. During the Sino-French War, the French attempted an invasion of Taiwan during the Keelung Campaign in 1884. Liu Mingchuan, who was leading the defense of Taiwan, recruited Aboriginals to serve alongside the Chinese soldiers in fighting against the French. The French were defeated at the Battle of Tamsui and the Qing forces pinned the French down at Keelung in an eight-month-long campaign before the French withdrew. Because of these incursions, the Qing government began constructing a series of coastal defenses and in 1885, work commenced to make Taiwan a province, with Liu Mingchuan serving as the first governor. He divided Taiwan into eleven counties and tried to improve relations with the aborigines. He also developed a railway from Taipei to Hsinchu, established a mine in Keelung, and built an arsenal to improve Taiwan's defensive capability against foreigners. Following a shipwreck of a Ryukyuan vessel on the southeastern tip of Taiwan in winter of 1871, in which the heads of 54 crew members were taken by the aboriginal Taiwanese Paiwan people in the Mudan incident, the Japanese sought to use this incident as a pretext to have the Qing formally acknowledge Japanese sovereignty over the Ryukyu Islands as Japanese territory and to test reactions to potential expansion into Taiwan. According to records from Japanese documents, Mao Changxi [zh] and Dong Xun [zh], the Qing ministers at Zongli Yamen who handled the complaints from Japanese envoy Yanagihara Sakimitsu [ja], replied first that they had heard only of a massacre of Ryukyuans, not of Japanese, and quickly noted that Ryukyu was under Chinese suzerainty, and therefore this issue was not Japan's business. In addition, the governor-general of the Qing province Fujian had rescued the survivors of the massacre and returned them safely to Ryukyu. The Qing authorities explained that there were two kinds of aborigines on Taiwan: those governed by the Qing, and those unnaturalized "raw barbarians ... beyond the reach of Qing government and customs." They indirectly hinted that foreigners traveling in those areas settled by indigenous people must exercise caution. After the Yanagihara-Yamen interview, the Japanese took their explanation to mean that the Qing government had not opposed Japan's claims to sovereignty over the Ryukyu Islands, disclaimed any jurisdiction over Aboriginal Taiwanese, and had indeed consented to Japan's expedition to Taiwan. The Qing dynasty made it clear to the Japanese that Taiwan was definitely within Qing jurisdiction, even though part of that island's aboriginal population was not yet under the influence of Chinese culture. The Qing also pointed to similar cases all over the world where an aboriginal population within a national boundary was not completely subjugated by the dominant culture of that country. The Japanese nevertheless launched an expedition to Mutan village with a force of 3600 soldiers in 1874. The number of killed Paiwan was about thirty, and that for the Japanese was six. Eventually, the Japanese withdrew after being paid a massive indemnity by the Qing. This incident caused the Qing to re-think the importance of Taiwan in their maritime defense strategy and greater importance was placed on gaining control over the wilderness regions. On the eve of the First Sino-Japanese War, about 45 percent of the island was administered under direct Qing administration while the remaining was lightly populated by Aborigines. In a population of around 2.5 million, about 2.3 million were Han Chinese and the remaining two hundred thousand were classified as members of various indigenous tribes. As part of the settlement for losing the Sino-Japanese War, the Qing empire ceded the islands of Taiwan and Penghu to Japan on April 17, 1895, according to the terms of the Treaty of Shimonoseki. The loss of Taiwan would become a rallying point for the Chinese nationalist movement in the years that followed. 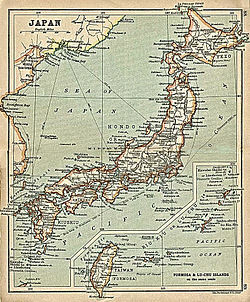 A 1912 map of Japan with Taiwan, which was ruled by the Empire of Japan from 1895 to 1945. Japan had sought to claim sovereignty over Taiwan (known to them as Takasago Koku (高砂國)) since 1592, when Toyotomi Hideyoshi undertook a policy of overseas expansion and extending Japanese influence southward and westward. To the west, Japan invaded Korea in that time period, with the eventual conquest of China contemplated. To the south an initial attempt to invade Taiwan and subsequent sporadic invasion attempts spanning three centuries were unsuccessful due mainly to disease and attacks by aborigines on the island. In 1609, the Tokugawa shogunate sent Harunobu Arima on an exploratory mission of the island. An attempted invasion in 1616, led by Murayama Tōan, failed when the fleet was dispersed by a typhoon and the only ship to reach the island was repelled. In the Mudan Incident of 1871, an Okinawan ship was wrecked on the southern tip of Taiwan and 54 crewmen were beheaded by Paiwan aborigines. After the Qing government refused to make compensation, stating that the aboriginals were not under its control, Japan launched a punitive expedition to the area in 1874, withdrawing after the Qing promised to pay an indemnity. It was not until the defeat of the Chinese navy during the First Sino-Japanese War in 1894–95 that Japan was finally able to gain possession of Taiwan, and with it saw the shifting of Asian dominance from China to Japan. The Treaty of Shimonoseki was signed on April 17, 1895, ceding Taiwan and the Penghu Islands to Japan, which would rule the island for 50 years until its defeat in World War II. After receiving sovereignty of Taiwan, the Japanese feared military resistance from Taiwanese who followed the establishment by the local elite of the short-lived Republic of Formosa. Taiwan's elite hoped that by declaring themselves a republic the world would not stand by and allow a sovereign state to be invaded by the Japanese, and therefore allied with the Qing. The plan quickly turned to chaos as standard Green troops[clarification needed] and ethnic Yue soldiers took to looting and pillaging Taiwan. Given the choice between chaos at the hands of Chinese or submission to the Japanese, the Taipei elite sent Koo Hsien-jung to Keelung to invite the advancing Japanese forces to proceed to Taipei and restore order. 1901 map with red line marking approximate boundary separating territory under actual Japanese administration from "Savage District"
Armed resistance was sporadic, yet at times fierce, but was largely crushed by 1902, although relatively minor rebellions occurred in subsequent years, including the Ta-pa-ni incident of 1915 in Tainan County. Nonviolent means of resistance began to take place of armed rebellions and the most prominent organization was the Taiwanese Cultural Association, founded in 1921. Taiwanese resistance was caused by several different factors (e.g., the Taishō Democracy). Some were goaded by Chinese nationalism, while others contained nascent Taiwanese self-determination. 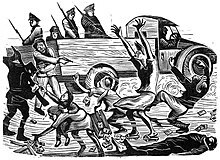 Rebellions were often caused by a combination of the effects of unequal colonial policies on local elites and extant millenarian beliefs of the local Taiwanese and plains Aborigines. Aboriginal resistance to the heavy-handed Japanese policies of acculturation and pacification lasted up until the early 1930s. The last major Aboriginal rebellion, the Musha (Wushe) Uprising in late 1930 by the Atayal people angry over their treatment while laboring in the burdensome job of camphor extraction, launched the last headhunting party in which over 150 Japanese officials were killed and beheaded during the opening ceremonies of a school. The uprising, led by Mona Rudao, was crushed by 2,000–3,000 Japanese troops and Aboriginal auxiliaries with the help of poison gas. Japanese colonization of the island fell under three stages. It began with an oppressive period of crackdown and paternalistic rule. 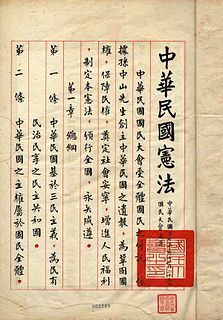 The second page was a dōka (同化) period of aims to treat all people (races) alike proclaimed by Taiwanese Nationalists who were inspired by the Self-Determination of Nations (民族自決) proposed by Woodrow Wilson after World War I. Finally, during World War II, a period of kōminka (皇民化), a policy which aimed to turn Taiwanese into loyal subjects of the Japanese emperor. Reaction to Japanese rule among the Taiwanese populace differed. Some felt that the safety of personal life and property was of utmost importance and went along with the Japanese colonial authorities. The second group of Taiwanese were eager to become imperial subjects, believing that such action would lead to equal status with Japanese nationals. The third group was influenced by Taiwan independence and tried to get rid of the Japanese colonials to establish a native Taiwanese rule. The fourth group on the other hand were influenced by Chinese nationalism and fought for the return of Taiwan to Chinese rule. From 1897 onwards, this last group staged many rebellions, the most famous one being led by Luo Fuxing [zh], who was arrested and executed along with two hundred of his comrades in 1913. Luo himself was a member of the Tongmenghui, an organization founded by Sun Yat-sen and was the precursor to the Kuomintang. Several strategies of resistance were undertaken. Bank of Taiwan established in 1897 headquartered in Taihoku (Taipei). Initial infrastructural development took place quickly. The Bank of Taiwan was established in 1899 to encourage Japanese private sectors, including Mitsubishi and the Mitsui Group, to invest in Taiwan. In 1900, the third Governor-General of Taiwan passed a budget which initiated the building of Taiwan's railroad system from Kirun (Keelung) to Takao (Kaohsiung). By 1905 the island had electric power supplied by water power in Sun-Moon Lake, and in subsequent years Taiwan was considered the second-most developed region of East Asia (after Japan). By 1905, Taiwan was financially self-sufficient and had been weaned off of subsidies from Japan's central government. Under the governor Shimpei Goto's rule, many major public works projects were completed. The Taiwan rail system connecting the south and the north and the modernizations of Kirun (Keelung) and Takao (Kaohsiung) ports were completed to facilitate transport and shipping of raw material and agricultural products. Exports increased by fourfold. 55% of agricultural land was covered by dam-supported irrigation systems. Food production had increased fourfold and sugar cane production had increased 15-fold between 1895 and 1925 and Taiwan became a major foodbasket serving Japan's industrial economy. A health care system was widely established and infectious diseases were almost completely eradicated. The average lifespan for a Taiwanese resident would become 60 years by 1945. Kagi Shrine, one of many Shinto shrines built in Taiwan. In October 1935, the Governor-General of Taiwan held an "Exposition to Commemorate the 40th Anniversary of the Beginning of Administration in Taiwan", which served as a showcase for the achievements of Taiwan's modernization process under Japanese rule. This attracted worldwide attention, including the Republic of China's Kuomintang (KMT) regime which sent the Japanese-educated Chen Yi to attend the affair. He expressed his admiration about the efficiency of Japanese government in developing Taiwan, and commented on how lucky the Taiwanese were to live under such effective administration. Somewhat ironically, Chen Yi would later become the ROC's first Chief Executive of Taiwan, who would be infamous for the corruption that occurred under his watch. The later period of Japanese rule saw a local elite educated and organized. During the 1930s several home rule groups were created at a time when others around the world sought to end colonialism. In 1935, the Taiwanese elected their first group of local legislators. By March 1945, the Japanese legislative branch hastily modified election laws to allow Taiwanese representation in the Japanese Diet. The Takasago Volunteers were a unit of the Japanese Army recruited from Taiwanese aboriginal tribes. As Japan embarked on full-scale war in China in 1937, it expanded Taiwan's industrial capacity to manufacture war material. By 1939, industrial production had exceeded agricultural production in Taiwan. At the same time, the "kōminka" imperialization project was put under way to instill the "Japanese Spirit" in Taiwanese residents, and ensure the Taiwanese would remain loyal subjects of the Japanese Emperor ready to make sacrifices during wartime. Measures including Japanese-language education, the option of adopting Japanese names, and the worship of Japanese religion were instituted. In 1943, 94% of the children received 6-year compulsory education. From 1937 to 1945, 126,750 Taiwanese joined and served in the military of the Japanese Empire, while a further 80,433 were conscripted between 1942 and 1945. Of the sum total, 30,304, or 15%, died in Japan's war in Asia. The Imperial Japanese Navy operated heavily out of Taiwan. The "South Strike Group" was based out of the Taihoku Imperial University (now National Taiwan University) in Taiwan. Many of the Japanese forces participating in the Aerial Battle of Taiwan-Okinawa were based in Taiwan. Important Japanese military bases and industrial centers throughout Taiwan, like Takao (now Kaohsiung), were targets of heavy American bombing. In 1942, after the United States entered the war against Japan and on the side of China, the Chinese government under the KMT renounced all treaties signed with Japan before that date and made Taiwan's return to China (as with Manchuria, ruled as the Japanese wartime puppet state of "Manchukuo") one of the wartime objectives. In the Cairo Declaration of 1943, the Allied Powers declared the return of Taiwan (including the Pescadores) to the Republic of China as one of several Allied demands. In 1945, Japan unconditionally surrendered with signing of the instrument of surrender and ended its rule in Taiwan as the territory was put under the administrative control of the Republic of China government in 1945 by the United Nations Relief and Rehabilitation Administration. In accordance with the provisions of Article 2 of San Francisco Peace Treaty, the Japanese formally renounced the territorial sovereignty of Taiwan and Penghu islands, and the treaty was signed in 1951 and came into force in 1952. At the date when the San Francisco Peace Treaty came into force, the political status of Taiwan and Penghu Islands was still uncertain. The Republic of China and Japan signed the Treaty of Taipei on April 28, 1952 and the treaty came into force on August 5. Writing in the American Journal of International Law, professors Jonathan I. Charney and J. R. V. Prescott argued that "none of the post–World War II peace treaties explicitly ceded sovereignty over the covered territories to any specific state or government." 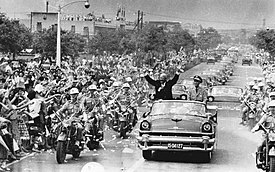 Beside President Chiang Kai-shek, the U.S. President Dwight D. Eisenhower waved to crowds during his visit to Taipei in June 1960. The Cairo Conference from November 22–26, 1943 in Cairo, Egypt was held to address the Allied position against Japan during World War II, and to make decisions about postwar Asia. One of the three main clauses of the Cairo Declaration was that "all the territories Japan has stolen from the Chinese, such as Manchuria, Formosa, and The Pescadores, shall be restored to the Republic of China". However, many challenged that the document was merely a statement of intent or non-binding declaration, for possible reference used for those who would draft the post-war peace treaty and that as a press release it was without force of law to transfer sovereignty from Taiwan to the Republic of China. Additional rationale to support this claim is that the Act of Surrender, and SCAP General Order no. 1, authorised the surrender of Japanese forces, not Japanese territories. The Republic of China established Taiwan Provincial Government in September 1945 and proclaimed on October 25, 1945 as "Taiwan Retrocession Day." This is the day in which the Japanese troops surrendered. The validity of the proclamation is subject to some debate, with some supporters of Taiwan independence arguing that it is invalid, and that the date only marks the beginning of military occupation that persists to the present. By 1938 about 309,000 Japanese lived in Taiwan. Between the Japanese surrender of Taiwan in 1945 and April 25, 1946, the Republic of China forces repatriated 90% of the Japanese living in Taiwan to Japan. During the immediate postwar period, the Kuomintang (KMT) administration on Taiwan was repressive and extremely corrupt compared with the previous Japanese rule, leading to local discontent. Anti-mainlander violence flared on February 28, 1947, prompted by an incident in which a cigarette seller was injured and a passerby was indiscriminately shot dead by Nationalist authorities. During the ensuing crackdown by the KMT administration in what became known as the February 28 Incident, tens of thousands of people were killed or arrested, and the incident became a taboo topic of discussion for the entire martial law era. From the 1930s onward the Chinese Civil War was underway in mainland China between Chiang Kai-shek's ROC government and the Communist Party of China led by Mao Zedong. When the Communists gained complete control of Mainland China in 1949, two million refugees, predominantly from the Nationalist government, military, and business community, fled to Taiwan. On October 1, 1949 the People's Republic of China (P.R.C.) was founded in mainland China by the victorious communists; several months before, Chiang Kai-shek had established a provisional ROC capital in Taipei and moved his government there from Nanjing. Under Nationalist rule, the mainlanders dominated the government and civil services. The Chinese Civil War led to severe inflation. Currency was issued in denominations of 1 million Old Taiwan dollars. In the immediate aftermath of World War II, post-war economic conditions compounded with the then-ongoing Chinese Civil War caused severe inflation across mainland China and in Taiwan, made worse by disastrous currency reforms and corruption. This gave way to the reconstruction process and new reforms. The KMT took control of Taiwan's monopolies that had been owned by the Japanese prior to World War II. They nationalized approximately 17% of Taiwan's GNP and voided Japanese bond certificates held by Taiwanese investors. These real estate holdings as well as American aid such as the China Aid Act and the Sino-American Joint Commission on Rural Reconstruction helped to ensure that Taiwan would recover quickly from war. The Kuomintang government also moved the entire gold reserve from the Chinese mainland to Taiwan, and used this reserve to back the newly issued New Taiwan dollar to stabilize the new currency and put a stop to hyperinflation. The KMT authorities implemented a far-reaching and highly successful land reform program on Taiwan during the 1950s. The 375 Rent Reduction Act alleviated tax burden on peasants and another act redistributed land among small farmers and compensated large landowners with commodities certificates and stock in state-owned industries. Although this left some large landowners impoverished, others turned their compensation into capital and started commercial and industrial enterprises. These entrepreneurs were to become Taiwan's first industrial capitalists. Together with businessmen who fled from mainland China, they once again revived Taiwan's prosperity previously ceased along with Japanese withdrawal and managed Taiwan's transition from an agricultural to a commercial, industrial economy. From 1950 to 1965, Taiwan received a total of $1.5 billion in economic aid and $2.4 billion in military aid from the United States. In 1965 all American aid ceased when Taiwan had established a solid financial base. Having accomplished that, ROC president Chiang Ching-kuo (the son of Chiang Kai-shek) started state projects such as the Ten Major Construction Projects that provided the infrastructure for building a strong export-driven economy. Taiwan has developed steadily into a major international trading power with more than $218 billion in two-way trade and one of the highest foreign exchange reserves in the world. Tremendous prosperity on the island was accompanied by economic and social stability. Taiwan's phenomenal economic development earned it a spot as one of the Four Asian Tigers. Until the early 1970s, the Republic of China was recognized as the sole legitimate government of China by the United Nations and most Western nations; who refused to recognize the People's Republic of China on account of the Cold War. The KMT ruled Taiwan under martial law until the late 1980s, with the stated goal of being vigilant against Communist infiltration and preparing to retake mainland China. Therefore, political dissent was not tolerated. The late 1970s and early 1980s were a turbulent time for Chinese people born in Taiwan, as many of the people who had originally been oppressed and left behind by economic changes became members of the Taiwan's new middle class. Free enterprise had allowed native Taiwanese to gain a powerful bargaining chip in their demands for respect for their basic human rights. The Kaohsiung Incident would be a major turning point for democracy in Taiwan. Taiwan also faced setbacks in the international sphere. In 1971, the ROC government walked out of the United Nations shortly before it recognized the PRC government in Beijing as the legitimate holder of China's seat in the United Nations. The ROC had been offered dual representation, but Chiang Kai-shek demanded to retain a seat on the UN Security Council, which was not acceptable to the PRC. Chiang expressed his decision in his famous "the sky is not big enough for two suns" speech. In October 1971, Resolution 2758 was passed by the UN General Assembly and "the representatives of Chiang Kai-shek" (and thus the ROC) were expelled from the UN and replaced as "China" by the PRC. In 1979, the United States switched recognition from Taipei to Beijing. Chiang Kai-shek died in April 1975, and was succeeded to the presidency by Yen Chia-kan while his son Chiang Ching-kuo succeeded to the leadership of the Kuomintang (opting to take the title "Chairman" rather than the elder Chiang's title of "Director-General"). Formerly the head of the feared secret police, Chiang Ching-kuo recognized gaining foreign support to securing the ROC's future security required reform. His administration saw a gradual loosening of political controls, a transition towards democracy, and moves toward Taiwanization of the regime. Opponents of the Nationalists were no longer forbidden to hold meetings or publish papers. Though opposition political parties were still illegal, when the Democratic Progressive Party was established as the first opposition party in 1986, President Chiang decided against dissolving the group or persecuting its leaders. Its candidates officially ran in elections as independents in the Tangwai movement. In the following year, Chiang ended martial law and allowed family visits to mainland China. Chiang selected Lee Teng-hui, a Taiwan born technocrat to be his vice president; the first in the line of succession to the presidency. The move followed other reforms giving more power to native born citizens and calmed anti-KMT sentiments. After Chiang Ching-kuo died in 1988, his successor, President Lee Teng-hui, continued to democratize the government. Lee transferred more government authority to Taiwanese born citizens, and Taiwan underwent a process of Taiwanization. In this localization process, local culture and history was promoted over a pan-China viewpoint. Lee's reforms included printing banknotes from the Central Bank instead of the usual Provincial Bank of Taiwan. He also largely suspended the operation of the Taiwan Provincial Government. In 1991 the Legislative Yuan and National Assembly elected in 1947 were forced to resign. These groups were originally created to represent mainland China constituencies. The restrictions on the use of Taiwanese languages in the broadcast media and in schools were also lifted. However, Lee failed to crack down on the massive corruption that pervaded the government and many KMT loyalists felt that Lee betrayed the ROC by taking reforms too far, while those in the opposition felt he did not take reforms far enough. Lee ran as the incumbent in Taiwan's first direct presidential election in 1996 against DPP candidate and former dissident, Peng Min-ming. This election prompted the PRC to conduct a series of missile tests in the Taiwan Strait to intimidate the Taiwanese electorate so that electorates would vote for other pro-unification candidates, Chen Li-an and Lin Yang-kang. The aggressive tactic prompted U.S. President Clinton to invoke the Taiwan Relations Act and dispatch two aircraft carrier battle groups into the region off Taiwan's southern coast to monitor the situation, and PRC's missile tests were forced to end earlier than planned. This incident is known as the 1996 Taiwan Straits Crisis. One of Lee's final acts as president was to declare on German radio that the ROC and the PRC have a special state to state relationship. Lee's statement was met with the PRC's People's Army conducting military drills in Fujian and a frightening island-wide blackout in Taiwan, causing many to fear an attack or cyberattack. The 2000 presidential election marked the end of the Kuomintang (KMT) rule. DPP candidate Chen Shui-bian won a three-way race that saw the Pan-Blue vote split by independent James Soong (formerly of the Kuomintang) and Kuomintang candidate Lien Chan. Chen garnered 39% of the vote. After the election, Soong formed the People First Party (PFP). In 2004, President Chen was re-elected to a second four-year term after an assassination attempt which occurred the day before the election. Two shots were fired, with one bullet grazing the President's belly after penetrating the windshield of a jeep and several layers of clothing and the other bullet penetrated the windshield and hitting the vice president's knee cast. (She was wearing a knee cast due to an earlier injury.) Police investigators have said that the most likely suspect is believed to have been Chen Yi-hsiung, who was later found dead. Their injuries were not life-threatening, but the incident is believed by Pan-Blue to have gained them enough sympathy to influence the result. That incident might also have given president Chen the ability to declare a state of emergency and martial law, which allegedly prevented the police and military, which were strongly Pan-Blue, from voting. Lien refused to concede, alleging voting irregularities. Kuomintang and PFP supporters held mass protests throughout the following weeks. Subsequently, Kuomintang and PFP took the case to the court. The High Court ordered a recount and found no evidence to support the accusation made by Kuomintang and PFP. The Court decided that the election result was legitimate and valid. During the legislative elections held on December 8, 2004, the Kuomintang-PFP dominated Pan-Blue alliance gained a slim majority in the elections which resulted in President Chen resigning as DPP chairman. The cabinet of Premier Yu Shyi-kun resigned, and Frank Hsieh assumed premiership on January 25, 2005. In a move that some[who?] 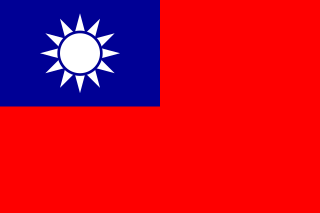 saw as a reaction to Chen's re-election, the People's Republic of China enacted a proposed anti-secession law that allows the use of force on Taiwan and the Republic of China government if it formally declares independence. However, this law was met with overwhelming protest from nearly all political parties and public figures of the Republic of China and disapproval from the western countries. Negotiations in January in Macau between the aviation authorities from both the Republic of China and People's Republic of China resulted in direct cross-strait charter flights between mainland China and Taiwan during the Chinese Lunar New Year Period. In a twist of events, President Chen and PFP Chairman Soong held a summit and the independence-leaning president indicated that eventual reunification with mainland China would be an option. Against the anti-secession law proposed by the People's Republic of China, President Chen held a video conference with the European Parliament in Brussels urging the European Union not to lift the arms embargo on the People's Republic of China. Domestic politics during the Chen administration were largely a political stalemate as the Kuomintang and PFP together held a pan-Blue majority in the legislature. Among the many items that made little progress due to the political stalemate were a stalled arms procurement bill, which would have advanced defense capabilities of the Republic of China through the purchase of weaponry, such as sub-hunting P-3 Orions, from the US government, and banking reform legislation, which would have helped in the consolidation of the many banks in the Republic of China, none of which hold even 10% shares of the local market. The president of the Republic of China, unlike the president of the United States, does not wield veto power, providing him with little to no leverage in negotiating with an opposition legislature, regardless of how slim the majority. The constitution was further amended in 2005, creating a two-vote electoral system, with single member plurality seats and proportional representative seats, and abolishing the National Assembly, transferring most of its former powers to the Legislative Yuan, and leaving further amendment voting to public referendums. The issue of formally declaring the independence of Taiwan is also a constant constitutional question. Arms purchases from the United States are still a controversial political question, with the Pan-Green Coalition camp favoring the purchase, and the Pan-Blue Coalition opposing it. Recent allegations about corruption inside the First Family had led to three recall motions votes in the Legislative Yuan aimed at ousting President Chen Shui-bian. All of them had failed since the Pan-Blue Coalition lacked the two-thirds majority required to complete the process and the political parties voted according to political lines. The First Lady, Wu Shu-chen was prosecuted for corruption, namely illegally using state funds for personal reasons. The president faced similar accusations as his wife, but was protected from prosecution by presidential immunity. He had promised to resign if his wife was found guilty. However, after his wife fainted in the preparation hearing, she had sought and obtained absence of leave from the Court 16 times citing health concerns before President Chen Shui-bian's term was complete. In December 2006, municipal and mayoral elections were held in Taipei and Kaohsiung. The KMT retained a clear majority in the capital, while the DPP and the KMT obtained very close results in the southern city of Kaohsiung. Huang Chun-ying lost to Chen Chu by a margin of 0.14 percent; 378,303 votes to 379,417 votes, making Chen Chu the first female mayor of a special municipality in the Republic of China. In 2007, the ROC applied for membership in the United Nations under the name "Taiwan", and was rejected by the General Assembly. In 2007, President Chen proposed a policy of Four Wants and One Without, which in substance states that Taiwan wants independence; Taiwan wants the rectification of its name; Taiwan wants a new constitution; Taiwan wants development; and Taiwanese politics is without the question of left or right, but only the question of unification or independence. The reception of this proposed policy in Taiwanese general public was unclear. It, however, was met with a cold reception by both the PRC and the United States. The PRC Foreign Minister emphasised that the Anti-Secession Law was not a piece of unenforceable legislation, while the US Department of State spokesman Sean McCormack described Chen's policy as "unhelpful". The KMT also retained control of the legislature in the Legislative Yuan elections in January 2008. In the presidential election in May 2008, KMT candidate Ma Ying-jeou ran on a platform supporting friendlier relations with mainland China and economic reforms, and defeated DPP candidate Frank Hsieh with 58.48% of the vote. On the same day President Chen left office, losing presidential immunity, the Supreme Prosecutor's Office announced that they were launching an inquiry into corruption charges regarding Chen. Later in 2008, members of his administration, including Chiou I-jen, a former National Security Council secretary-general, and Yeh Sheng-mao, former director-general of the Ministry of Justice's Investigation Bureau, were arrested on corruption charges. Chiou I-jen was found not guilty, while Yeh Sheng-mao was convicted and sentenced to 10 years in prison. Ma was re-elected, and the KMT retained its majority in the Legislative Yuan, in combined elections in January 2012. In March and April 2014, students protesting against undemocratic methods used by the KMT occupied the parliament building. In the end, the government agreed to put on hold the ratification of an agreement with China which they had pushed through without proper debate. This event had far reaching consequences, and changed the mood of the electorate. In the combined elections in January 2016 the opposition candidate for President, Tsai Ing-wen, of the DPP won with 56% of the vote, and the opposition DPP was catapulted into an outright majority in the parliament. The election marked the first time a non-KMT party won a majority in the legislature. The elections held on November 24, 2018 resulted in a major setback for the DPP majority and led to President Tsai Ing-wen resignation as leader of the party. The DPP lost a total of nine legislative seats, giving the KMT control of the majority of the 22 seats. KMT mayoral candidates won in New Taipei City, Taichung and Kaohsiung, the latter of which has been a political stronghold for the DPP for 20 years. ^ a b Olsen & Miller-Antonio (1992). ^ a b Jiao (2007), pp. 89–90. ^ a b Jiao (2007), pp. 91–94. ^ a b Chang (1989). ^ Zuozhen Man Archived 2012-07-15 at Archive.today, Encyclopedia of Taiwan. ^ Changbin Culture Archived 2014-05-03 at the Wayback Machine, Encyclopedia of Taiwan. ^ Hung, Hsiao-chun (2017). "Neolithic Cultures in Southeast China, Taiwan, and Luzon". First Islanders: Prehistory and Human Migration in Island Southeast Asia. By Bellwood, Peter. Wiley Blackwell. pp. 232–240. ISBN 978-1-119-25154-5. ^ Tapenkeng Site, Encyclopedia of Taiwan. ^ a b Blust (1999). ^ Hill et al. (2007). ^ Bird, Hope & Taylor (2004). ^ Jiao (2007), pp. 94–103. ^ Xiong (2012), p. 201. ^ Tanaka Fumio 田中史生 (2008). "Kodai no Amami Okinawa shotō to kokusai shakai" 古代の奄美・沖縄諸島と国際社会. In Ikeda Yoshifumi. Kodai chūsei no kyōkai ryōiki 古代中世の境界領域. pp. 49–70. ^ Borao Mateo (2002), pp. 2–9. ^ Andrade, Tonio (2007). How Taiwan Became Chinese. (Project Gutenberg Edition). Columbia University Press. p. 129. ISBN 9622090834. ^ Wills (2006), pp. 88–89. ^ Wills (2006), p. 91. ^ a b Blusse & Everts (2000). ^ Everts (2000), pp. 151–155. ^ Borao Mateo (2002), pp. 329–333. ^ Blusse & Everts (2000), pp. 300–309. ^ Wang, Hsing'an (2009). "Quataong". Encyclopedia of Taiwan. ^ Chiu (2008), pp. 99–102. ^ Shepherd (1993), pp. 1–29. ^ Keliher (2003), p. 32. ^ Spence (1999), pp. 46–49. ^ Clements (2004), pp. 188–201. ^ Covell, Ralph R. (1998). Pentecost of the Hills in Taiwan: The Christian Faith Among the Original Inhabitants (illustrated ed.). Hope Publishing House. pp. 96–97. ISBN 0932727905. Retrieved 10 December 2014. ^ Hsin-Hui, Chiu (2008). The Colonial 'civilizing Process' in Dutch Formosa: 1624 – 1662. Volume 10 of TANAP monographs on the history of the Asian-European interaction (illustrated ed.). BRILL. p. 222. ISBN 900416507X. Retrieved 10 December 2014. ^ Spence (1999), pp. 51–57. ^ Clements (2004), p. 215. ^ Teng (2004), pp. 34–59. ^ Teng (2004), pp. 34–49, 177–179. ^ Tai, Pao-tsun (2007). The Concise History of Taiwan (Chinese-English bilingual ed.). Nantou City: Taiwan Historica. p. 52. ISBN 9789860109504. ^ a b Shih-Shan Henry Tsai (2009). Maritime Taiwan: Historical Encounters with the East and the West. Routledge. pp. 66–67. ISBN 978-1-317-46517-1. ^ Leonard H. D. Gordon (2007). Confrontation Over Taiwan: Nineteenth-Century China and the Powers. Lexington Books. p. 32. ISBN 978-0-7391-1869-6. ^ Leung (1983), p. 270. ^ Morris (2002), pp. 5–6. ^ a b Zhang (1998), p. 514. ^ Huang (2005), European Occupation of Taiwan and Confrontation between Holland in the South and Spain in the North. ^ Smits, Gregory (2007). "Recent Trends in Scholarship on the History of Ryukyu's Relations with China and Japan" (PDF). In Ölschleger, Hans Dieter. Theories and Methods in Japanese Studies: Current State and Future Developments (Papers in Honor of Josef Kreiner). Göttingen: Bonn University Press via V&R Unipress. pp. 215–228. ISBN 978-3-89971-355-8. ^ Chiu, Hungdah (1979). China and the Taiwan Issue. London: Praeger Publishers. ISBN 0-03-048911-3. ^ Paine, S.C.M (2002). The Sino-Japanese War of 1894–1895: Perceptions, Power, and Primacy. London: Cambridge University Press. ISBN 0-521-81714-5. ^ Ravina, Mark (2003). The Last Samurai: The Life and Battles of Saigo Takamori. Wiley. ISBN 0-471-08970-2. ^ Smits, Gregory (1999). "Visions of Ryūkyū: Identity and Ideology in Early-Modern Thought and Politics." Honolulu: University of Hawai'i Press. ^ Morris (2002), pp. 4–18. ^ a b Katz (2005). ^ Ching (2001), pp. 137–140. ^ Zhang (1998), p. 515. ^ HUANG-WEN LAI (2015). "The turtle woman's voices: Multilingual strategies of resistance and assimilation in Taiwan under Japanese colonial rule" (pdf published=2007). p. 113. Retrieved 11 November 2015. ^ Lowther, William (9 Jun 2013). "CIA report shows Taiwan concerns". Taipei Times. p. 1. Retrieved 2015-09-28. [Quoting from a declassified CIA report on Taiwan written in March 1949] From the legal standpoint, Taiwan is not part of the Republic of China. Pending a Japanese peace treaty, the island remains occupied territory in which the US has proprietary interests. ^ Jonathan I. Charney and J. R. V. Prescott. "Resolving Cross-Strait Relations Between China and Taiwan". American Journal of International Law, July 2000. Retrieved 2011-01-30. ^ "The Japanese Act of Surrender". Taiwan Documents Project. 2002. Retrieved 2010-09-01. ^ Kerr (1966), pp. 254–255. ^ Singh (2010), p. 50. ^ Hu (2005), pp. 26–27. ^ Hu (2005), pp. 32–43. ^ Hu (2005), pp. 33–34. ^ "US Says Taiwanese President's Independence Remarks 'Unhelpful'". Voice of America. 2007-03-05. ^ Chuang, Jimmy (5 Dec 2008). "Yeh Sheng-mao sentenced to 10 years in prison". Taipei Times. p. 1. ^ Bush, Richard C. (5 December 2018). "Taiwan's local elections, explained". Brookings. Brookings Institutution. Retrieved 8 December 2018. ^ Hsiao, Russell (28 November 2018). "The Global Taiwan Brief Volume 3, Issue 23". Global Taiwan Institute. Global Taiwan Institute. ^ Horton, Chris (24 November 2018). "Taiwan's President Quits as Party Chief After Stinging Losses in Local Races". The New York Times. The New York Times. Retrieved 8 December 2018. Bird, Michael I.; Hope, Geoffrey; Taylor, David (2004), "Populating PEP II: the dispersal of humans and agriculture through Austral-Asia and Oceania" (PDF), Quaternary International, 118–119: 145–163, doi:10.1016/s1040-6182(03)00135-6. Blusse, Leonard; Everts, Natalie (2000), The Formosan Encounter: Notes on Formosa's Aboriginal Society – A selection of Documents from Dutch Archival Sources Vol. I & II, Taipei: Shung Ye Museum of Formosan Aborigines, ISBN 957-99767-2-4 and ISBN 957-99767-7-5. Blust, Robert (1999), "Subgrouping, circularity and extinction: some issues in Austronesian comparative linguistics", in E. Zeitoun; P.J.K Li, Selected papers from the Eighth International Conference on Austronesian Linguistics, Taipei: Academia Sinica, pp. 31–94. Borao Mateo, Jose Eugenio (2002), Spaniards in Taiwan Vol. II:1642–1682, Taipei: SMC Publishing, ISBN 978-957-638-589-6. Campbell, Rev. William (1915), Sketches of Formosa, London, Edinburgh, New York: Marshall Brothers Ltd. reprinted by SMC Publishing Inc 1996, ISBN 957-638-377-3, OL 7051071M. Chan (1997), "Taiwan as an Emerging Foreign Aid Donor: Developments, Problems, and Prospects", Pacific Affairs, 70 (1): 37–56, doi:10.2307/2761227, JSTOR 2761227. Chang, K.C. (1989), translated by W. Tsao, ed. by B. Gordon, "The Neolithic Taiwan Strait" (PDF), Kaogu, 6: 541–550, 569, archived from the original (PDF) on 2012-04-18. Ching, Leo T.S. (2001), Becoming "Japanese" – Colonial Taiwan and The Politics of Identity Formation, Berkeley: University of California Press., ISBN 978-0-520-22551-0. Chiu, Hsin-hui (2008), The Colonial 'Civilizing Process' in Dutch Formosa, 1624–1662, BRILL, ISBN 978-90-0416507-6. Clements, Jonathan (2004), Pirate King: Coxinga and the Fall of the Ming Dynasty, United Kingdom: Muramasa Industries Limited, ISBN 978-0-7509-3269-1. Diamond, Jared M. (2000), "Taiwan's gift to the world", Nature, 403 (6771): 709–710, doi:10.1038/35001685, PMID 10693781. Everts, Natalie (2000), "Jacob Lamay van Taywan: An Indigenous Formosan Who Became an Amsterdam Citizen", Ed. David Blundell; Austronesian Taiwan:Linguistics' History, Ethnology, Prehistory, Berkeley, CA: University of California Press. Gates, Hill (1981), "Ethnicity and Social Class", in Emily Martin Ahern; Hill Gates, The Anthropology of Taiwanese Society, Stanford University Press, ISBN 978-0-8047-1043-5. Guo, Hongbin (2003), "Keeping or abandoning Taiwan", Taiwanese History for the Taiwanese, Taiwan Overseas Net. Hill, Catherine; Soares, Pedro; Mormina, Maru; Macaulay, Vincent; Clarke, Dougie; Blumbach, Petya B.; Vizuete-Forster, Matthieu; Forster, Peter; Bulbeck, David; Oppenheimer, Stephen; Richards, Martin (2007), "A Mitochondrial Stratigraphy for Island Southeast Asia", The American Journal of Human Genetics, 80 (1): 29–43, doi:10.1086/510412, PMC 1876738, PMID 17160892. Hsu, Wen-hsiung (1980), "From Aboriginal Island to Chinese Frontier: The Development of Taiwan before 1683", in Knapp, Ronald G., China's Island Frontier: Studies in the historical geography of Taiwan, University Press of Hawaii, pp. 3–29, ISBN 978-0-8248-0743-6. Hu, Ching-fen (2005), "Taiwan's geopolitics and Chiang Ching-Kuo's decision to democratize Taiwan" (PDF), Stanford Journal of East Asian Affairs, 1 (1): 26–44, archived from the original (PDF) on 2012-10-15. Jiao, Tianlong (2007), The neolithic of southeast China: cultural transformation and regional interaction on the coast, Cambria Press, ISBN 978-1-934043-16-5. Katz, Paul (2005), When The Valleys Turned Blood Red: The Ta-pa-ni Incident in Colonial Taiwan, Honolulu, HA: University of Hawaii Press, ISBN 978-0-8248-2915-5. Keliher, Macabe (2003), Out of China or Yu Yonghe's Tales of Formosa: A History of 17th Century Taiwan, Taipei: SMC Publishing, ISBN 978-957-638-608-4. Kerr, George H (1966), Formosa Betrayed, London: Eyre and Spottiswoode. Leung, Edwin Pak-Wah (1983), "The Quasi-War in East Asia: Japan's Expedition to Taiwan and the Ryūkyū Controversy", Modern Asian Studies, 17 (2): 257–281, doi:10.1017/s0026749x00015638. Morris, Andrew (2002), "The Taiwan Republic of 1895 and the Failure of the Qing Modernizing Project", in Stephane Corcuff, Memories of the Future: National Identity issues and the Search for a New Taiwan, New York: M.E. Sharpe, ISBN 978-0-7656-0791-1. Olsen, John W.; Miller-Antonio, Sari (1992), "The Palaeolithic in Southern China", Asian Perspectives, 31 (2): 129–160. Spence, Jonathan D. (1999), The Search for Modern China (Second Edition), USA: W.W. Norton and Company, ISBN 978-0-393-97351-8. Singh, Gunjan (2010), "Kuomintang, Democratization and the One-China Principle", in Sharma, Anita; Chakrabarti, Sreemati, Taiwan Today, Anthem Press, pp. 42–65, doi:10.7135/UPO9781843313847.006, ISBN 978-0-85728-966-7. Takekoshi, Yosaburō (1907), Japanese rule in Formosa, London, New York, Bombay and Calcutta: Longmans, Green, and co., OCLC 753129, OL 6986981M. Teng, Emma Jinhua (2004), Taiwan's Imagined Geography: Chinese Colonial Travel Writing and Pictures, 1683–1895, Cambridge MA: Harvard University Press, ISBN 978-0-674-01451-0. Tsang, Cheng-hwa (2000), "Recent advances in the Iron Age archaeology of Taiwan", Bulletin of the Indo-Pacific Prehistory Association, 20: 153–158, doi:10.7152/bippa.v20i0.11751, archived from the original on 2012-03-25, retrieved 2012-06-07. Wills, John E., Jr. (2006), "The Seventeenth-century Transformation: Taiwan under the Dutch and the Cheng Regime", in Rubinstein, Murray A., Taiwan: A New History, M.E. Sharpe, pp. 84–106, ISBN 978-0-7656-1495-7. Xiong, Victor Cunrui (2012), Emperor Yang of the Sui Dynasty: His Life, Times, and Legacy, SUNY Press, ISBN 978-0-7914-8268-1. Zhang, Yufa (1998), Zhonghua Minguo shigao 中華民國史稿, Taipei, Taiwan: Lian jing (聯經), ISBN 957-08-1826-3. Asia Society (14 March 2000), Opposition Wins Taiwan Election, archived from the original on 15 June 2000. Brown, Melissa J (1996), "On Becoming Chinese", in Melissa J. Brown, Negotiating Ethnicities in China and Taiwan, Berkeley, CA: University of California Press. Brown, Melissa J. (2001), "Reconstructing ethnicity: recorded and remembered identity in Taiwan", Ethnology (2). Brown, Melissa J (2004), Is Taiwan Chinese? : The Impact of Culture, Power and Migration on Changing Identities, Berkeley: University of California Press, ISBN 0-520-23182-1. Chen, Chiu-kun (1997), Qing dai Taiwan tu zhe di quan, (Land Rights in Qing Era Taiwan), Taipei, Taiwan: Academia Historica, ISBN 957-671-272-6. Chen, Chiukun (1999), "From Landlords To Local Strongmen: The Transformation Of Local Elites In Mid-Ch'ing Taiwan, 1780-1862", in Rubinstein, Murray A., Taiwan : a New history, Armonk, N.Y.: M.E. Sharpe, pp. 133–62. Chu, Jou-juo (2001), Taiwan at the end of The 20th Century:The Gains and Losses, Taipei: Tonsan Publications. Council of Indigenous Peoples. (2004), Table 1. Statistics of Indigenous Population in Taiwan and Fukien Areas for Townships, Cities and Districts, archived from the original on 2007-09-27, retrieved 2007-03-18. Cohen, Marc J. (1988), Taiwan At The Crossroads: Human Rights, Political Development and Social Change on the Beautiful Island, Washington D.C.: Asia Resource Center. Copper, John F. (2003), Taiwan:Nation-State or Province? Fourth Edition, Boulder, CO: Westview Press. Crossley, Pamela Kyle (1999), A Translucent Mirror: History and Identity in Qing Imperial Ideology, Berkeley: University of California Press, ISBN 0-520-23424-3. Council of Indigenous Peoples, Executive Yuan (2006), Statistics of Indigenous Population in Taiwan and Fukien Areas, archived from the original on 2006-08-30. Dikotter, Frank (1992), The Discourse of Race in Modern China, Stanford, CA: Stanford University Press, ISBN 0-8047-2334-6. Ebrey, Patricia (1996), "Surnames and Han Chinese Identity", in Melissa J. Brown, Negotiating Ethnicities in China and Taiwan, Berkeley, CA: University of California Press, ISBN 1-55729-048-2. Edmondson, Robert (2002), "The February 28 Incident and National Identity", in Stephane Corcuff, Momories of the Future:National Identity Issues and the Search for a New Taiwan, New York: M.E. Sharpe. Faure, David (2001), In Search of the Hunters and Their Tribes, Taipei: Shung Ye Museum of Formosan Aborigines Publishing, ISBN 957-30287-0-0. Gao, Pat (2001), Minority, Not Minor, Government Information Office, Republic of China, archived from the original on 13 March 2007, retrieved 22 March 2007. Gold, Thomas B. (1986), State and society in the Taiwan miracle, Armonk, New York: M.E. Sharpe. Harrell, Steven (1996), "Introduction", in Melissa J. Brown, Negotiating Ethnicities in China and Taiwan, Berkeley, CA: Regents of the University of California, pp. 1–18. Harrison, Henrietta (2001), "Changing Nationalities, Changing Ethnicities: Taiwan Indigenous Villages in the Years after 1946", in David Faure, In Search of the Hunters and Their Tribes: Studies in the History and Culture of the Taiwan Indigenous People, Taipei: SMC Publishing. Harrison, Henrietta (2001), Natives of Formosa: British Reports of the Taiwan Indigenous People, 1650–1950, Taipei: Shung Ye Museum of Formosan Aborigines Publishing, ISBN 957-99767-9-1. Harrison, Henrietta (2002), "Changing Nationalities, Changing Ethnicities", in David Faure, In Search of the Hunters and Their Tribes: Studies in the History and Culture of the Taiwan Indigenous People, Taipei: SMC Publishing. Harrison, Henrietta (2003), "Clothing and Power on the Periphery of Empire: The Costumes of the Indigenous People of Taiwan. ", positions (2): 331–60. Hattaway, Paul (2003), Operation China. Introducing all the Peoples of China, Pasadena, CA: William Carey Library Pub, ISBN 0-87808-351-0. Hong, Mei Yuan (1997), Taiwan zhong bu ping pu zhu (Plains Tribes of Central Taiwan), Taipei, Taiwan: Academia Historica. Hsiau, A-chin (1997), "Language Ideology in Taiwan: The KMT's language policy, the Tai-yü language movement, and ethnic politics", Journal of Multilingual and Multicultural Development (4). Hsiau, A-chin (2000), Contemporary Taiwanese Cultural Nationalism, London: Routledge, ISBN 9780415226486. Hsu, Cho-yun (1980), "The Chinese Settlement of the Ilan Plain", in Ronald Knapp, China's Island Frontier: Studies in the Historical Geography of Taiwan, HA: University of Hawaii Press. Hsu, Wen-hsiung (1980), "Frontier Organization and Social Disorder in Ch'ing Taiwan", in Ronald Knapp, China's Island Frontier: Studies in the Historical Geography of Taiwan, HA: University of Hawaii Press. Huang, Fu-san (2005). "Chapter 3". A Brief History of Taiwan. ROC Government Information Office. Archived from the original on 2007-08-01. Retrieved 2006-07-18. Ka, Chih-ming (1995), Japanese Colonialism in Taiwan:Land Tenure, Development and Dependency, 1895–1945, Boulder, CO: Westview Press..
Kang, Peter (2003), "A Brief Note on the Possible Factors Contributing to the Large Village Size of the Siraya in the Early Seventeenth Century", in Leonard Blusse, Around and About Formosa, Taipei. Kleeman, Faye Yuan (2003), Under An Imperial Sun: Japanese Colonial Literature of Taiwan and The South, Honolulu, HA: University of Hawaii Press..
Knapp, Ronald G (1980), "Settlement and Frontier Land Tenure", in Ronald G.Knapp, China’s Island Frontier: Studies in the Historical Geography of Taiwan, Honolulu: University of Hawaii Press, ISBN 957-638-334-X. Kuo, Jason C. (2000), Art and Cultural Politics in Postwar Taiwan, Seattle, WA. Lamley, Harry J (1981), "Subethnic Rivalry in the Ch'ing Period", in Emily Martin Ahern and Hill Gates, The Anthropology of Taiwanese Society, CA: Stanford University Press, pp. 283–88. Liu, Tan-Min (2002), ping pu bai she gu wen shu (Old Texts From 100 Ping Pu Villages), Taipei: Academia Sinica, ISBN 957-01-0937-8. Liu, Tao Tao (2006), "The Last Huntsmen's Quest for Identity: Writing From the Margins in Taiwan", in Yeh Chuen-Rong, History, Culture and Ethnicity: Selected Papers from the International Conference on the Formosan Indigenous Peoples, Taipei: SMC Publishing, pp. 427–430. Manthorpe, Jonathan (2008), Forbidden Nation: A History of Taiwan, Palgrave Macmillan. Matsuda, Kyoko (2003), "Ino Kanori's 'History' of Taiwan: Colonial ethnology, the civilizing mission and struggles for survival in East Asia. ", History and Anthropology, 14 (2): 179–196, doi:10.1080/0275720032000129938. Mendel, Douglass (1970), The Politics of Formosan Nationalism, Berkeley, CA: University of California Press..
Meskill, Johanna Menzel (1979), A Chinese Pioneer Family: The Lins of Wu-Feng, Taiwan 1729–1895, Princeton New Jersey: Princeton University Press. Millward, James (1998), Beyond The Pass: Economy, Ethnicity and Empire in Qing Central Asia, 1759–1864, Stanford CA. : Stanford University Press. Nussbaum, Louis-Frederic (2002), "Ryūkyū kizoku mondai", Japan Encyclopedia, Cambridge: Harvard University Press. Pan, Da He (2002), pingpu bazai zu cang sang shi (The Difficult History of the Pazih Plains Tribe), SMC Publishing, ISBN 957-638-599-7. Pan, Ying (1996), Taiwan pingpu zu shi (History of Taiwan's Pingpu Tribes), Taipei: SMC Publishing, ISBN 957-638-358-7. Phillips, Steven (2003), Between Assimilation and Independence:The Taiwanese Encounter Nationalist China, 1945-1950, Stanford California: Stanford University Press. Pickering, W.A. (1898), Pioneering In Formosa, London: Hurst and Blackett, OL 7204709M. Republished 1993, Taipei, SMC Publishing. ISBN 957-638-163-0. Reuters, "Taiwan election shooting suspect dead," (2005)|reference=Reuters. "Taiwan election shooting suspect dead," 7 March 2005. Rubinstein, Murray A. (1999), Taiwan: A New History, New York: M.E. Sharpe, Inc, ISBN 1-56324-816-6. Shepherd, John Robert (1995), Marriage and Mandatory Abortion among the 17th Century Siraya, Arlington VA.
Simon, Scott (4 January 2006), "Formosa's First Nations and the Japanese: from Colonial Rule to Postcolonial Resistance", Japan Focus, archived from the original on 13 March 2007. Accessed 3/16/2007. Skoggard, Ian A. (1996), The Indigenous Dynamic in Taiwan's Postwar Development: Religious and Historical Roots of Entrepreneurship, New York: M.E.Sharpe Inc..
Stainton, Michael (1999), "The Politics of Taiwan Aboriginal Origins", in Murray A. Rubinstein, Taiwan A New History, New York: M.E. Sharpe, Inc, ISBN 1-56324-816-6. Tseng, Ching-Nan (1993), In search of China's Minorities, Beijing: China Books & Periodicals. Watchman, Alan M. (1994), Taiwan:National Identity and Democratization, New York: M.E.Sharpe Inc.
Wilson, Richard W (1970), Learning To Be Chinese: The Political Socialization of Children in Taiwan, Cambridge, MA: Massachusetts Institute of Technology. Zeitoun, Elizabeth; Yu, Ching-Hua (2005), "The Formosan Language Archive: Linguistic Analysis and Language Processing" (PDF), Computational Linguistics and Chinese Language Processing, 10 (2): 167–200. 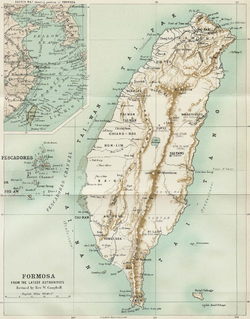 Wikimedia Commons has media related to History of Taiwan. Taiwanization, also known as the Taiwanese localization movement, is a conceptual term used in Taiwan to emphasize the importance of a Taiwanese culture, society, economy, nationality, and identity rather than to regard Taiwan as solely an appendage of China. This involves the teaching of the history of Taiwan, geography, and culture from a Taiwan-centric perspective, as well as promoting languages locally established in Taiwan, including Taiwanese Hokkien (Taiwanese), Hakka, and aboriginal languages. 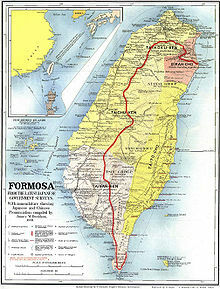 The Kingdom of Tungning or Kingdom of Formosa was a government that ruled part of southwestern Formosa (Taiwan) between 1661 and 1683. It was founded by Koxinga as part of the loyalist movement to restore the Ming dynasty in China after it was overthrown by the Manchu-led Qing dynasty. Koxinga hoped to recapture the Chinese mainland from the Qing, using the island as a base of operations. Until its incorporation into the Qing Dynasty in 1683, the Kingdom was ruled by Koxinga's heirs, the House of Koxinga. This is a list of rulers of island of Taiwan. The Government of the Republic of China, commonly known as the Government of Taiwan, is the democratic, constitutional government that exercises control over Taiwan and the other islands in the free area. The president is the head of state. The government consists of five Yuans (branches), the Executive Yuan, Legislative Yuan, Judicial Yuan, Control Yuan, and Examination Yuan. The recordkeeping and development of the economic history of Taiwan started in the Age of Discovery. In the 17th century, the Europeans realized that Taiwan is located on the strategic cusp between the Far East and Southeast Asia. Two main European empires that competed to colonize it were the Dutch and Spanish Empires. Taiwan also became an intermediate destination for trade between Western European empires and East Asia states. The history of Taiwan as a colony of the Dutch Empire, Kingdom of Tungning, Qing China, and Empire of Japan between 1630 and 1945 was based heavily on economics.